Bella found her forever home in just a few days. We were so delighted to help her owner, Matt, find the perfect home for her so quickly. 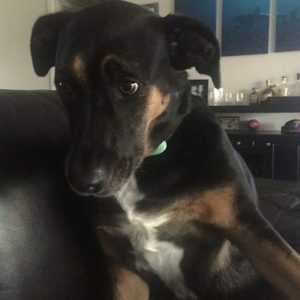 He is looking forward to keeping in touch with Bella’s new owner, Wez, a work-from-home professional with a big house and heart to share with Bella. 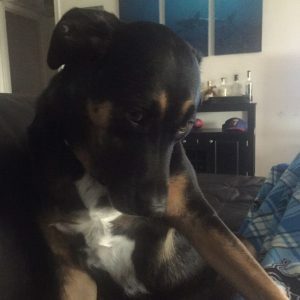 Need to Rehome a Dog in Miami? 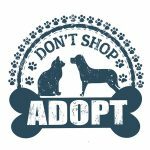 We are experts in finding good homes for preloved dogs and puppies throughout Florida. Need our help? Please get in touch by contacting our pet rehoming coordinator or calling toll free (888) 720-3322. 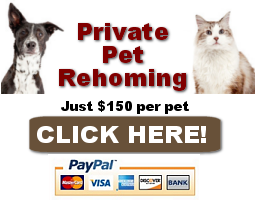 You can also request pet rehoming services here! Bella is such a cute dog! 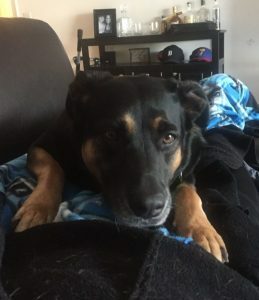 This healthy, 4 year old mix of the best qualities of the German Shepherd and Rottweiler dog breeds is as sweet inside as she is beautiful on the outside. Bella has been spayed, is up to date on shots, is very healthy, and house broken. She is well behaved and crate trained. Bella has undergone obedience training, and walks very well on a leash. Bella is great with other dogs and cats. She has no experience around children, but would be fine with kids older than 12, for certain. Bella has one small quirk; she is a “foot muncher”. It is a playful game that she likes to play sometimes when she meets new people. She doesn’t mean any harm by it, but it is important to understand that she is playing, should this happen when you meet her. Bella’s owner loves her so very much. His better half has severe pet allergies, and they have tried everything to be able to keep Bella. Unfortunately, having Bella in the home has made his partner’s health issue severe, and they must find her a good home as a result. Bella is a great dog who would fit in well with many dog lovers. She likes her exercise, so she needs an owner who is active and can take her for a long walk/run each day. Bella would love to live with owners who have a securely fenced back yard for her to play in. She would probably love a doggie-friend to hang out with, too. If you have been looking for a very special, very pretty dog that has been trained and has all her veterinary work done to date, Bella is waiting to steal your heart. She is a big baby that believes she is a lap dog. She is very loving and likes affection and being pet. She is trained to sit, lay, shake, and stay to a certain distance. She is crate trained and loves rope toys most. She is not destructive at all, and not a dominant personality. She barks at outside noises on occasion, and is very attentive. She likes to follow people around the house, and is extremely loyal. She likes Iams – currently being fed two times per day in the morning and evening. I use small treats for training. My longtime girlfriend is extremely allergic to her. We have tried everything to overcome this. We will be moving in with each other soon.